Located in one of the largest caverns in the United States, Mega Zips is the world’s only fully underground zip line course and the number one attraction in Louisville, according to Trip Advisor. This large limestone cavern with room after room was formed after decades of mining. You’ll hear all about the caverns’ unique history and geology as you zip down 17 miles of twisting passageways in the pitch dark. This thrilling experience will get your adrenaline pumping and you’ll learn tidbits about the city as you cruise through the darkness. Plus, they have Wi-Fi down there, so you can instantly upload all your memories to social media to make your family and friends back home jealous of your adventures! Home of the Kentucky Derby and known for its iconic Twin Spires, Churchill Downs might just be the world’s most famous race track. No other track embodies the spirit of horse racing as much as this one does; it holds the title for the longest-running, continuous sporting event in the nation: the aforementioned Derby. Rich in history, spectators flock to watch beautiful thoroughbreds compete for ultimate prestige as they gallop along the one mile race track, kicking up clouds of dirt. While there are tours offered now, starting every May embrace tradition by grabbing a mint julep, throwing on an extravagantly large hat, and belting out the time-honored song “My Old Kentucky Home,” and experience a day you won’t soon forget. Since her maiden voyage in 1914, the Belle of Louisville has transported more than 7 million passengers as the oldest operating steamboat in the United States. Though she gained National Historic Landmark status in 1989, her paddlewheel has not stopped churning to carry passengers down the Ohio River as a memorable way to see Louisville. So climb aboard and find yourself taking a step into living American history. Built in 1895, this pedestrian and bicyclist-only bridge connects Louisville, Kentucky to Jeffersonville, Indiana across the Ohio River. The Big Four Bridge gets its name from the original railroad that once ran across it: Cleveland, Cincinnati, Chicago and St. Louis Railway that connected these “big four” cities. This popular and romantic Louisville spot gets more than one million visitors ever year as people enjoy strolling along and taking in the scenery. On the Kentucky side, the bridge leads right to the Riverwalk, which enables walkers to head to the downtown area of Louisville. Beautiful views and a deep history make this bridge a one-of-a-kind trail. World famous champion boxer, Muhammad Ali called Louisville home, and the Muhammad Ali Center is a testament to his legacy and principles. This cultural and educational center features three levels of captivating exhibits that pay tribute to the Ali’s six core principles of confidence, conviction, dedication, giving, respect, and spirituality. When you visit, you take a journey into the heart of a champion through award-winning galleries and interactive exhibits. It is a place to explore greatness within yourself, as well as your community and country—just as he did. It also has some pretty specacutalar views of the Ohio River and the city that aren’t to be missed. 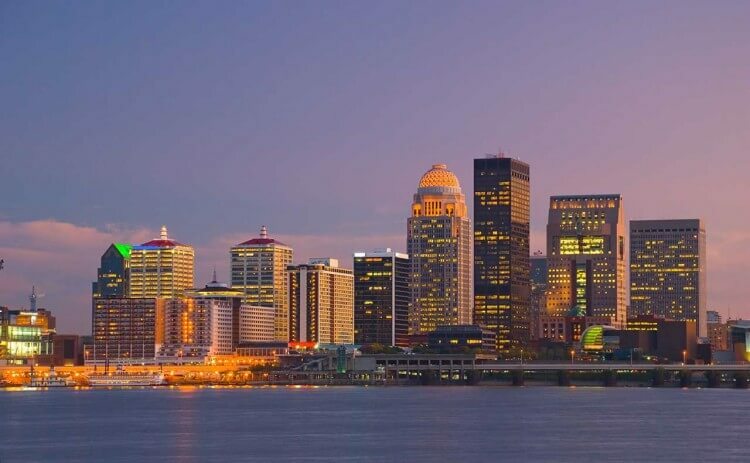 Follow the sound of music and laughter to Louisville’s premier dining and entertainment destination located in the heart of downtown. Fourth Street Live! is a 350,000 square-foot complex that features dozens of shops, restaurants, bars, and nightlife venues so visitors can sample a little of everything that the city has to offer. Whether you’re looking for a quiet place to watch some revered local college basketball or rowdy bar where you can kick up your feet and dance, Fourth Street has it all. It also is known to host festivals, concerts, and other large outdoor events—so there is sure to be something for everyone! You didn’t think we’d get through this list without recommending a place to try some famous Louisville bourbon brewed with local limestone filtered water, did you? While bourbon is a spirit that you pour into a glass, it is also a spirit that defines the culture and creative energy of Louisville. Located in the heart of Louisville’s Historic Whiskey Row, Down One is esteemed for its selection of more than 160 different types of bourbon—a list so extensive it has to be broken down into eras. The venue has a speakeasy theme and includes a Prohibition Era secret room, accessed through a phone booth, with some of the rarest bourbons available. This joint also serves a delicious locally sourced food menu that you can enjoy on its peaceful patio lined with magnolia trees. Looking for a little bit of paranormal activity? Take a guided ghost tour of the Waverly Hills Sanatorium. Opened in July of 1910, Waverly Hills was the final destination for thousands of patients suffering from tuberculosis. For more than 50 years, the staff of the sanatorium treated patients in ways that today are considered inhumane. Nearly 6,000 patients died at the facility. As a result, today, Waverly Hills is considered one of the most haunted places in America; thousands of visitors come every year to see the building and its grounds, learn of the history, and chance an encounter with one of the many ghosts that are rumored to haunt the halls. The tour season runs from March through August, so sign up for one—if you dare.